Forget about Star Power and perfect solos, there's loop-the-loops and spiked pits to navigate with a cartoon rabbit-woman-thing. Games like Guitar Hero and Rock Band fuse music and videogames together, but they also heap increasing levels of complexity on what are, at their core, simple games about reactions and timing. In Issue 277 of The Escapist, Brendan Main talks about Vib-Ribbon, a game where all you had to do was dance. Vib-Ribbon was released in Japan and Europe on the PlayStation, but at first glance it would seem more at home on a beat up old Atari scavenged from your uncle's garage. The game consists of thin, white lines on a black field. It begins by showing a series of hollow squares that stretch and squash to form thin, horizontal lines - then, there is the sound of a swelling orchestral score, and the lines twang and vibrate in turn ... This graphical economy springs from a technical problem - Vib-Ribbon was designed to work with whatever musical CD you liked, a spot normally reserved for the game disc itself. The solution was to create a vector-graphics game small enough to load entirely into the system's memory, freeing up the system's disc slot for a CD of whatever tunes tickle your fancy. But despite looking like a game from the Asteroids-era, this vector aesthetic never seems outdated or crude. 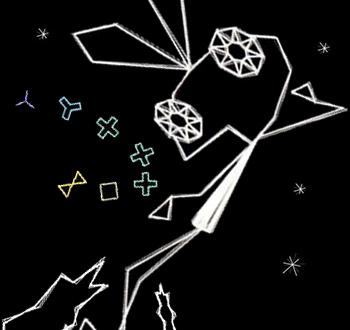 Vib-Ribbon has good graphics, in the sense that they perfectly suit the game. Rather than seeming stiff, or unplayable, this simple animation has looseness and a lightness of form. Polygons snap and contract to the beat as if strummed by an invisible hand. In later levels, the track itself begins bouncing around, winding back on itself, forcing the player to trace that winding line to the musical tempo to prepare for upcoming obstacles. Packed to the gills with character, Vib-Ribbon was simple, but not simplistic, and was a wholly unique experience that no one has yet tried to replicate. You can read more about it in Main's article, "The Thin White Line."